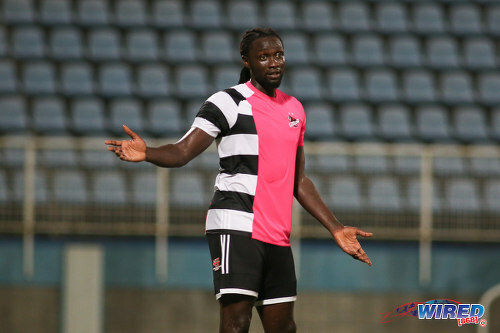 Trinidad and Tobago National Senior Team captain Kenwyne Jones was the headline act at the Ato Boldon Stadium in Couva last night, as the Pro League season got underway with the Digicel Charity Shield, which pitted league champions Central FC against Pro League winners Defence Force. 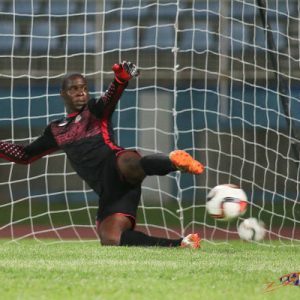 But, in the end, it was Jones’ international teammate, Jan-Michael Williams, who stole the show, as the Soca Warriors goalkeeper marked his return to competitive action with three penalty saves as the Couva Sharks beat Defence Force 3-1 on kicks from the penalty mark after a 2-2 regulation time draw. 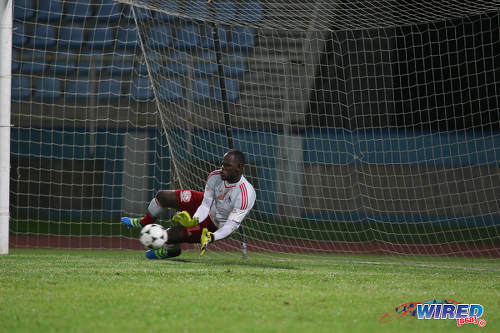 Photo: Central FC goalkeeper Jan-Michael Williams saves a penalty from Defence Force captain Jerwyn Balthazar during the Digicel Charity Shield on 10 September 2016. Williams saved three penalties as Central won 3-1 from kicks from the penalty mark after a 2-2 regulation time draw. The result means that Central FC now have the honour of donating a TT$10,000 cheque from the sponsor to a charity of their choice. But, for local football fans, it was an appetiser with no main course in sight. The Caribbean Football Union (CFU) National Under-17 competition gets going on Friday 16 September in Trinidad and the competition for suitable venues might have forced the Pro League towards less conventional arenas like Mahaica Oval, Irwin Park, the Centre of Excellence and the Barataria Recreation Ground. Instead, it seems that the local top flight has opted to continue the habit of delaying its season opener until a yet unspecified date. 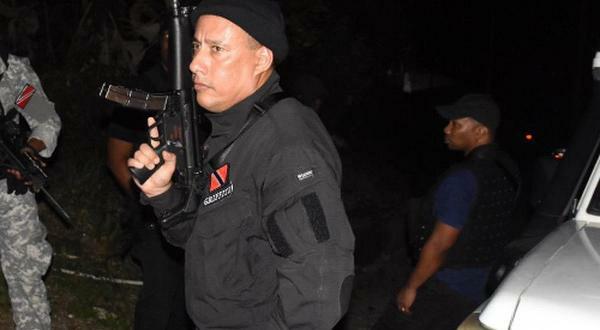 It is easy to imagine Soca Warriors head coach Stephen Hart—who leads his team into the first Caribbean Cup fixture against the Dominican Republic on 5 October—wringing his hands in despair. 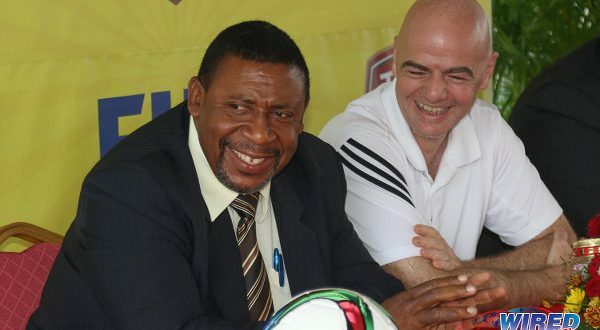 Six players from Hart’s Russia 2018 World Cup qualifying campaign are Pro League employees while he has capped another 23 players from the local top flight in friendly competition. 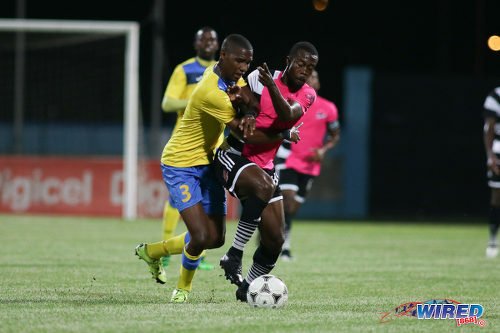 Photo: Central FC attacker Marcus Joseph (right) tries to hold off Defence Force defender Jamali Garcia during the Digicel Charity Shield on 10 September 2016. 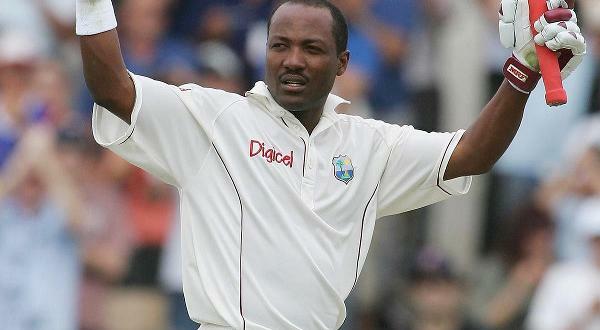 Garcia and Joseph are both capped by Trinidad and Tobago National Senior Team coach Stephen Hart. At least there were some moments for Warriors fans to savour at Couva yesterday in the Pro League’s curtain raiser. Central, who are two games into their new season already—thanks to the CONCACAF Champions League—and have added Jones to a team that won two successive league titles, were huge favourites against the depleted Army/Coast Guard combination. Defence Force were without as many as 10 members of the team that played in their successful 2016 Pro Bowl title, just three and a half months ago, with Curtis Gonzales, Dave Long, Jelani Felix, Kerry Joseph, Richard Roy and the incarcerated Ross Russell Jr among the more noticeable absentees. And they looked set to pay a heavy price for their shortcomings, as the Sharks raced to a two goal lead within the opening five minutes. Jones should have scored in the third minute, off a Marcus Joseph cross, but Darren Mitchell—who was the Charity Shield’s official man of the match—was on spot to tap home the loose ball. While, two minutes later, the Warriors captain did get his name on the score sheet with a simple finish off another Joseph delivery. It was Jones’ second goal from as many outings with the Sharks. 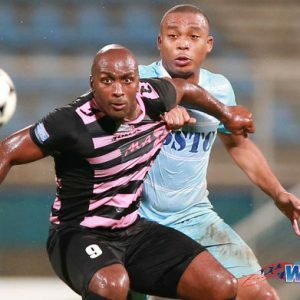 But Central got caught resting on their laurels and veteran poacher Devorn Jorsling halved the deficit in the 19th minute with a header into an empty net after an effort from Defence Force winger Justin Garcia fell kindly for him. The “Teteron Boys” might have equalised in the 27th minute too but for a superb low save from Javon Sample, after Jorsling had played Hashim Arcia behind the Central defence. Tactically, Central deployed what might be their new Plan A this season with three mobile attacking midfielders, Marcus Joseph, Keron “Ball Pest” Cummings and Mitchell, tucked close behind Jones with the intention of feeding off his leaping headed flick ons off long punts upfield from their backline. The strategy still needs work though. All three midfielder seemed to prefer playing in front of the opposing defence rather than running behind while most of the lofted deliveries to Jones were so shockingly wayward that “abysmal” seems kind. As a result, Jones often got the ball on the ground where, even at Pro League level, he was not able to distinguish himself. Not yet anyway. And it was Williams—who replaced Sample at the half for his first appearance since suffering a shoulder injury seven months ago—who ended up as the unlikely saviour. Photo: Defence Force playmaker Hashim Arcia (right) has his effort blocked by Central FC captain Leston Paul during the Digicel Charity Shield on 10 September 2016. The Warriors custodian, who was on the CONCACAF Goalkeeper of the Year shortlist for 2013 and 2014, managed fine saves from Arcia in the 56th minute and four minutes into stoppage time. Although he had no answer for a deflected Sean Narcis strike in the 89th minute that sent the game to penalties. Jorsling sent Williams the wrong way with the first kick, which put Defence Force 1-0 ahead. 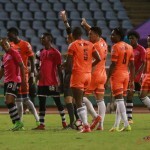 But the veteran Trinidad and Tobago goalkeeper then denied Arcia (low to his right) and Jerwyn Balthazar and Marvin Jones (low to his left) to set the stage for Central’s first trophy of the season. Defence Force custodian Andre Marchan pushed Joseph’s rocket on to the bar. But Leston Paul, Sean De Silva and Nicholas Dillon all converted to see Central through. Now it is on to the serious business of the actual Pro League competition—although nobody seems quite sure when. Central FC (4-2-3-1): 1.Javon Sample (GK) (21.Jan-Michael Williams (GK) 46); 15.Kaydion Gabriel, 4.Andre Ettienne, 13.Robert Primus, 24.Kevon Villaroel; 6.Leston Paul (captain), 19.Nathaniel Garcia; 99.Marcus Joseph, 10.Keron Cummings (8.Sean De Silva 81), 11.Darren Mitchell (14.Nicholas Dillon 89); 9.Kenwyne Jones. Unused substitutes: 3.Keion Goodridge, 7.Jason Marcano, 16.Kadeem Corbin, 17.Johan Peltier. Unused substitutes: 25.Sheldon Clarke (GK), 4.Dave Long, 5.Devin Jordan, 19.Thurlani George. Photo: Central FC forward Kenwyne Jones looks on during Digicel Charity Shield action against Defence Force on 10 September 2016. 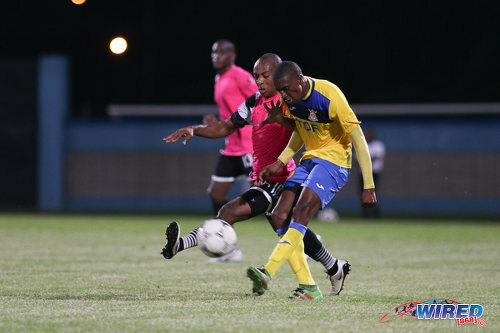 Central FC 3 (Leston Paul, Sean De Silva, Nicholas Dillon), Defence Force 1 (Devorn Jorsling). Well bound not to score should be scoring in every game in the proleague eh. Them really good yes. That is a very ugly top for central…. please Kevin or Brent change that jersey…. Lmao… I cannot believe that kit went through a focus group or a board looked at it and was like that is absolutely good or incredible sweet. Let’s be real Lasana Liburd would u buy that to cheer your team on? Maybe the board was bored. Lol. ..Meantime, Bobby Wood just scored for Hamburg against Bayer Leverkusen..